Ductile iron, also known as ductile cast iron, nodular cast iron, spheroidal graphite iron, spheroidal graphite cast iron. While most varieties of cast iron are brittle, ductile iron has much more impact and fatigue resistance, due to its nodular graphite inclusions that are spherical in shape rather than striated. Ductile iron is not a single material but part of a group of materials which can be produced with a wide range of properties through control of their micro-structure. The common defining characteristic of this group of materials is the shape of the graphite. In ductile irons, graphite is in the form of nodules rather than flakes as in gray iron. 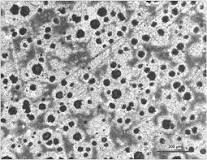 Whereas sharp graphite flakes create stress concentration points within the metal matrix, rounded nodules inhibit the creation of cracks, providing the enhanced ductility that gives the alloy its name.